Tone is “the will” of the message. It carries and reveals the emotional state of the messenger. If we are angry, our tone will express it. If we are curious, the tone will convey that. It’s the outer edge of the message, the first part of it to be delivered and received. It is the basis of the first impression. It frames all of the other elements, including the content of the message. Harold was still a fetus, with barely any of the features of what we would call consciousness, but already he was listening, and memorizing the tone of his mother’s voice. You can’t fake tone. It will always reveal your true state, and will also reveal that you tried to cover it up. 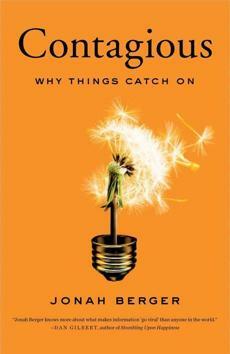 The new book, Contagious: Why Things Catch On, covers one of my favorite topics – how ideas spread through word-of-mouth. Its author, Jonah Berger is marketing professor with considerable chops, and I’ve listened to him on numerous podcasts, read articles he’s written, and interviews he’s given. I’ve gone to his site and looked at the extra material he’s collected to go with the book. I’ve even downloaded a sample of the book from Amazon to my Kindle, and found it extremely engaging. I really want to read the book. But…I simply can’t bring myself to plop down the money to buy it. I’ve been tempted over and over, and somehow I’ve managed to resist the temptation. First, there is the magnitude of the marketing campaign – Berger seems to be hitting me from every direction and in every possible way. Normally,I would consider that to be a positive, especially when it comes to books about marketing. But in this case, the standards are different. A book about how to use word-of-mouth should use word-of-mouth as a major part of it’s marketing. Instead, the overwhelming and slick campaign feels more like a hard sell, and my natural defenses against that are coming to the surface. I can practically feel myself not wanting to reward the campaign by contributing financially to its success. Second, I’m less than 100% convinced by the premise of the book. The samples I’ve read so far give me a good overview of the approach Berger is using. He identifies six specific reasons why information spreads. In his media appearances and articles I’ve been exposed to, he talks a great deal about social capital. That idea is very strong and useful. No arguments about that one. But he also refers to another way things spread, which he calls “triggers,” and uses it to explain the runaway success of Rebecca Black’s song “Friday.” This is where I feel let down. According to Berger, the reason the song hit it big, and then got even bigger, was because of the name. Every Friday, people would be reminded about the song and views on YouTube would spike. It may be true that people would look for the song on Friday more than any other day, but it hardly explains why people ever bothered to look for it in the first place. Perhaps the book chapter gives a more detailed explanation of how a song so reviled became so popular. After all, there are so many songs uploaded to YouTube every day. How did this one song break out? But I suspect that if that information were part of the book, it would have been at least alluded to in the article as well. That’s not to say that book isn’t worth reading. In fact, I’m ready to consume almost any media that involves Berger discussing the book’s contents. I’m even looking up the academic papers he’s written that serve as the scientific basis for the book. But I don’t want to feel like a sucker. And there is something about the way the book is coming across the makes me worried that that’s exactly how I’ll feel if I purchase the book. And even though the book is Contagious, that’s enough for me to keep the virus at bay. I know I don’t fall into the majority on this one. The book is still on the New York Times best-seller list, more than two months after its publication. With the rise of social media, personal profiles and photos usually give people the first hint of our personalities. And according to a recent study at Sonoma University, appearance plays an important role in communicating our personalities, especially in the all-important First Impression. “The appearance one portrays in his or her photographs has important implications for their professional and social life,” said Sonoma psychologist Laura Naumann, who carried out the study along with Sam Gosling of The University of Texas. In the study, participants were asked to view full-body photos of people they never met in controlled poses and in natural poses. They were then asked questions about the people based on their observations and their answers were compared to answers from people who knew the people in the photos. While some information was accurately gleamed from the controlled poses, the study revealed just how much information is communicated in the natural poses. Participants were able to correctly identify nine out of 10 personality traits from the way people presented themselves in the pictures. Naumann said the finding can help people create the impression they want to make. “If you want potential employers or romantic suitors to see you as a warm and friendly individual, you should post pictures where you smile or are standing in a relaxed pose,” she suggests. Once upon a time, storytellers tended to limit their craft to one medium such as a book or a film. If their stories underwent a “transmedia” transformation – if a novel were turned into a movie or a movie turned into a novel – the new form simply repeated the story from the original medium. It did not extend the universe of the story, amplify sub-themes from the original work, or provide useful background on main or secondary characters. For most fans, the closer the “remake” clung to the original, the better. Henry Jenkins, who popularized the term transmedia in his book Convergence Culture, notes that some stories can become too large for any individual to master. To work properly, transmedia storytelling depends on a collective intelligence generated by the people who experience the stories (and even those who create them). That’s why the rise of the Internet, and particularly the host of Web 2.0 platforms, has been vital to the rise of the new narrative form. “Reality Mining” is a new form of research that employs real data, such as cell phone use, to learn about trends that might otherwise be overlooked. The method seems to be particularly effective in dispelling the myths of conventional wisdom. It also reveals the gap between reality and virtual reality. MIT student Benjamin Waber used the technique to study social patterns among a group of workers. Instead of asking people about their social habits, Waber outfitted each employee with an electronic monitor that tracked the location and duration of all their conversations. Waber’s results, as documented in Wired magazine, show that social networks in the real world function differently from social networks in cyberspace; sometimes the two are diametrically opposed. In the face-to-face world, though, Waber says, groups are more productive when the team members know each other well, sharing extremely strong links. That’s because face-to-face teamwork requires intimacy, he says, and “when you’re among friends you can really capitalize on preexisting protocols” — nods, grunts, in-jokes — for talking and listening. The research also gave Waber strong insight into how information flows through the company. Waber found that one person in each network serves as a super-connector, getting news out to the team. Not surprisingly, that person is almost never the manager. It’s usually the person working below the radar who’s getting the real stuff done. Of course, the knock on reality mining is the obvious infringement of privacy, which will only increase as the method grows and continues showing imperssive results. But according to MIT researcher Nathan Eagle, the key is finding ways to use the information that serve the common good. Does an Idea Spread Like a Virus or a Forest Fire? Conventional word-of-mouth wisdom sees information spreading like a virus, infecting the masses through a small group of influential individuals. Bring a few “influentials” on board with your product or idea, the concept goes, and they will spread it for you on their own through their large social networks and natural enthusiasm. The virus model itself spread like a virus across the field of marketing. It sits at the heart of popular marketing books such as The Tipping Point and The Anatomy of Buzz, and has spawned a whole new field of marketing, called viral marketing. But according to network-theory scientist Duncan Watts, the virus model, and especially its reliance on influentials, fails to account for important aspects of how information travels. Influentials may increase the number of people exposed to an idea, but there is little evidence to show they are vital to the start of any trend. A better model, he suggests, is that of a forest fire. Thousands of fires begin in forests each year, but only a few grow into massive blazes. The key factors that determine whether the fires spread, he said, are environmental – whether the forest is ready to ignite. If the earth is dry and the wind is blowing in a favorable direction, any match could could create a major catastrophe. But the same match dropped on a rainy day would have no effect at all. It may sound counter-intuitive, but the best way to spread your message is to target your established base. Those are the people who care the most about what you are saying and the ones most likely to tell their friends. They are also the ones who are likely to act on your message, bringing it out of the realm of pure rhetoric and into the real world. Stephan Covey, in the Seven Habits of Hightly Effective People, refers to a similar concept when writing about the Circle of Influence. He asks readers to make a list of the things they care about enough about to expend some of our mental or emotional energy on them. That is the Circle of Concern. Within that list, he suggests making a division between the things they can change and the things they can’t. That is the Circle of Influence. Playing to the base works the same way. The more ideas are reinforced, the more relevence they accumulate. This concept is particularly true in politics. A centrist, Middle-of-the-road candidate may not offend people from either side, but he’s unlikely to inspire them either. Candidates who clearly articulate the views of their supporters have a greater chance of bringing them to the polls. The strategy worked for George W. Bush in the last two elections. The Washington Post analyzed Bush’s strategy, as guided by his advisor Karl Rove. Rove has argued that tending to your political base and reaching beyond it are not incompatible. He talks of raising “bold colors” on conservative issues such as tax cuts, the protection of unborn life and the appointment of originalist judges. At the same time, he has advocated policy innovations to appeal to new voters… From 2000 to 2004, this approach excited conservative enthusiasm; boosted President Bush’s support among Hispanics, Asian Americans, Catholics and women; and increased his popular vote total in his reelection bid by 23 percent. By keeping the base firmly in his corner, Rove had no difficulty finding common ground with other demographic groups. Had he pursued the new voters without taking care of his base, he would have lost both and probably the election as well.